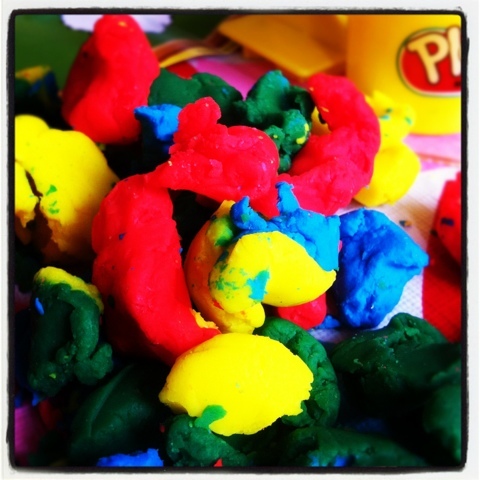 This picture of play-doh pretty much encapsulates the evolution of my parenting style. With my first baby, when we played with the dough I would bring out one, maybe two colors and try not to get the colors mixed. By the third kid, pretty much everything gets more relaxed. I’ve learned to chill about the play-doh and let them enjoy it, sometimes some very pretty colors can result. The third wasn’t potty trained until after three when she decided to go about it on her own, I still felt some of that mommy guilt that she wasn’t done by two, but it didn’t posses me. Tomorrow is Wicked! It should be a special night for my oldest and I, we get to go to a special themed dinner at one of the steak houses in town, I’ve painted my nails green in honor of the occasion. This entry was posted in Parenting, Project 366 and tagged daughter, Instagram, parenting, photograph, Play-doh, project 366. Bookmark the permalink.